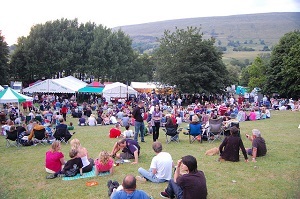 Dentdale Music and Beer Festival is a free-entry, community-led, not-for-profit festival that aims to provide entertainment for all the family. The main stage marquee is on the Festival Field in Dent village where you’ll find terrific real ales and locally sourced, home-made, freshly cooked food. As well as giving adults access to a wonderful time, there is a separate area on the Festival Field dedicated to younger visitors. Throughout each day, parents have the opportunity for their little ones and young adults to experience their own festival fun, with games, live entertainment and the chance to learn new skills (or develop existing ones) with craft demonstrations and participation. There are plenty of toilets, and also baby-changing facilities sited in and around the purpose-built toilet block at the top of the field. In the two village pubs, music of all varieties rings out throughout the day and into the night. Add to that street performers in the cobbled roads – clog and traditional dancing and other individual and group musicians (sometimes impromptu) – and you’ll have a totally unforgettable experience. If you haven’t had enough after all of the organised activities have finished, simply potter along to one of the two nearby campsites and it’s more than likely that you’ll come across a group of musicians who just can’t bear to quit and go to bed. You’ll be treated to some mellow, acoustic tunes to prepare you for slumber. The dates for the 2019 festival will be 28th – 30th June 2019.